How to make your own simple vegan butter– I know it sounds next to impossible, but you can make your own butter with less than 10 minutes of preparation. All the while feeling good about the fact that your food is free of cholesterol and cruelty to animals. Vegan butter is a super healthy alternative for all your desserts and pastries. Just imagine the recipes or dishes that you have avoided just because it is too buttery or too unhealthy. Well, the possibilities with your own homemade vegan butter are virtually endless and you do not have to curb your cravings for that special dessert anymore. Thus far, I have tried several recipes with this and I am yet to be disappointed. Most important of all, it comes in very handy for the breakfast toasts I have to prepare for the kids. The homemade butter applies just as well as the real version. It has a consistency that just melts in your mouth. I have tried the store bought versions of vegan butter and I would definitely say that my homemade version will stand up to it. Better yet, the homemade version will be free of Lecithin. So it is again, a healthy alternative. 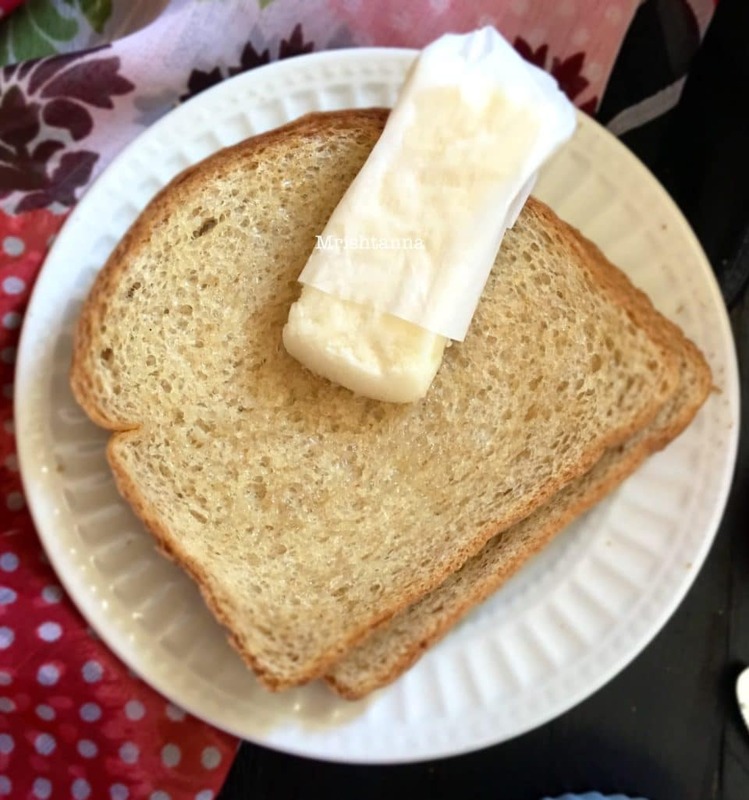 The basic idea of making homemade vegan butter is not anything new but I have tried this with several alternate ingredients and they work very well. Check out the list of ingredients in my recipe and you will see that I have listed options that I have tried that work. Also, check out my video and share it with your friends and family. 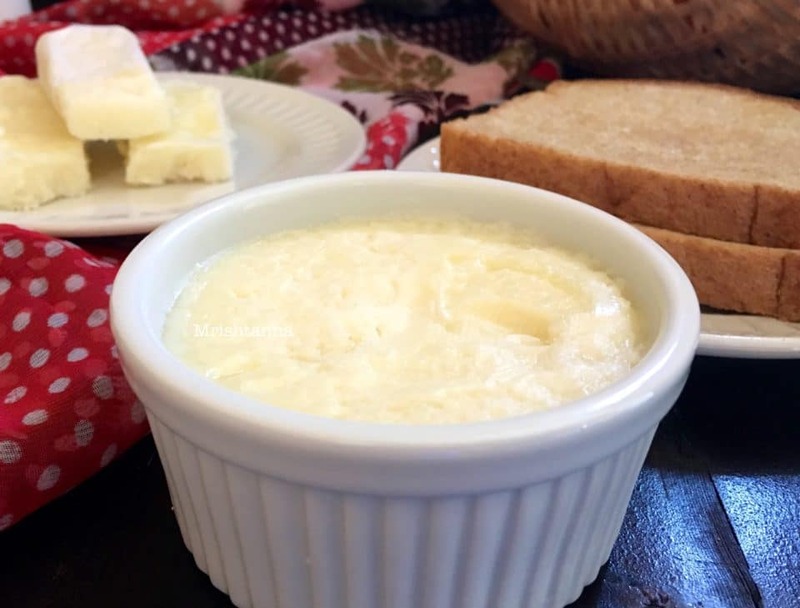 Replacing butter with this vegan, homemade butter could be a great gift of health! This vegan butter is perfect for making homemade vegan naan. For more recipes please subscribe through email. Thanks for visiting my blog. 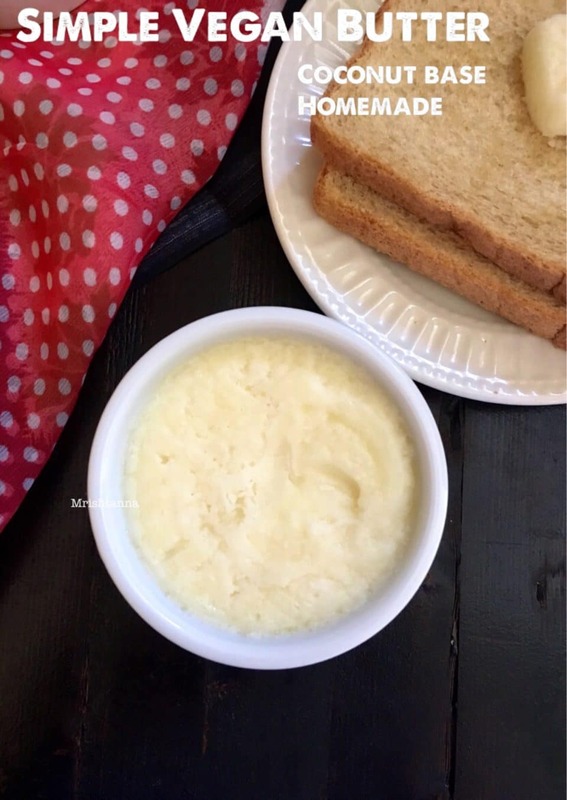 Homemade Vegan Butter is easy and perfect for toast or baking recipes. 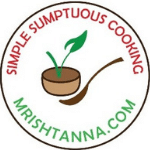 If the refined coconut oil is solid (Depending on your weather), melt it in low heat. Set it in a small pan in the refrigerator and let it solidify. 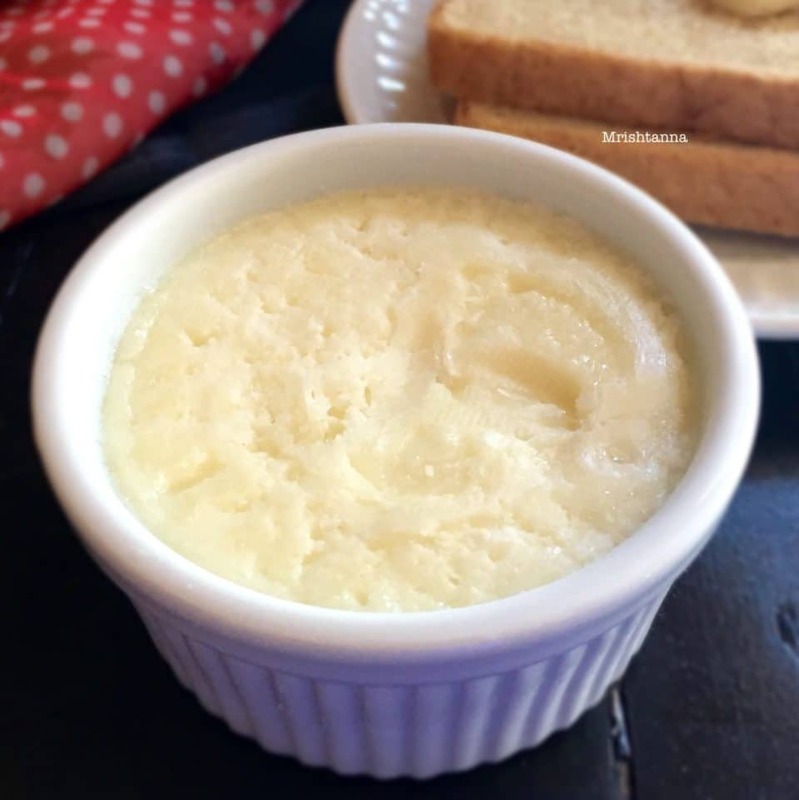 Your homemade Simple Vegan butter is ready! Cut them into long sticks or little cubes! That is perfect! I love the combo of good ingredients you used! My granddaughter can’t have dairy and I’m always looking for a good sub for her. This sounds easy! Thanks for stopping by:) Hope Your granddaughter will love this Butter. Great idea I am not vegan and do not have an issue with dairy but it is alwasy nice to learn how to make dairy free recipes. That looks so good and just like butter. I’m going to pass it on to a friend – she has a dairy free diet – I’m sure she will love it. This is so helpful! I have some vegan friends who I know will appreciate this! I’ve never tried making butte myself but I love how simple you made it look. I have a lot of vegan friends and they always say they wish they had butter for their bread! Thansk for a great recipe! Very intersting how easy that looks. What a great idea. I love the ingenuity in this recipe! As I read the headline, I thought: How on Earth is she going to do this?! Well, I kept reading and found out. Sure seems like a good alternative to the dairy. Thanks you Noel 🙂 This is definitely good alternative to the dairy. Ahhh I’ve been wanting to make my own butter for FAR too long! Thanks for the super easy recipe and inspiration! Ive been meaning to try making my own butter! This looks so easy! I have never actually tried making my own butter. I do love butter, it’s something I always like to have on hand and use often. Sound like a good alternative for those who need to watch their diet. It’s great that there are other alternatives instead of going without. You make is sound simple. This looks fantastic for everyone, not just vegans. I love using coconut oil, but have never even thought to use it as butter. Thanks for this idea! This is a great option for vegans and also for others who want a different flavor in their butter. Never imagined that coconut oil could bring this great texture. This looks so amazing Uma. A lot of my friends n family members are vegan or turned vegan due to some issues and I just sent your recipe to them. Thanks, I’ve been looking for something like this. I will give it a try. Seriously, that’s all you need to make butter? This is the only recipe that makes me want to make my own. I’ve seen weird ingredients in some and well no, it sounded complicated. Thank you for a stress free easy and cheap way of making my own! Yes of course:) I am using as a butter substitute. Thanks. What brand coconut oil is used and is the olive oil; extra virgin? Nutriva – Refined coconut oil. And used pure olive oil. Not extra virgin. You can use vegetable oil instead of olive oil. Thanks for stopping by! I am so excited! My classroom is going gluten free, dairy free, and sugar free to help support one of our co-workers that was diagnosed as pre-diabetic at 22. I love to cook and bake but often times need butter and that was where I was stuck. I am so grateful for this recipe!! Thank you!! Thank you! Hope you will like this 🙂 Good Luck! Thank you for sharing this recipe! Can this butter be stored at room temperature in a butter keeper (not a butter dish)? And, if not, how long can it be kept in the refrigerator? If it is cold weather you can keep for 3 days. I suggest it will be last long in freezer up to 2 months.Thank you. This is a wonderful recipe! I used a hand held blender and this butter thickened beautifully! I also used avocado oil in place of olive oil. I ground oats for the tsp flour, very easy. Other recipes I have seen call for things like nutritional yeast and vinegar. :/ This butter is so nice and simple. It’s delicious and looks like store bought butter. Thank you for this lovely recipe.